‘Shriram Naamsamkeertan’ drive undertaken at Mumbai, Thane, Navi Mumbai, Raigad, Nashik, Yeotmal, Nandurbar and Jalgaon ! Hundreds of devotees write letters to Supreme Court for expediting judicial process ! Thousand of devotees sign representation ! 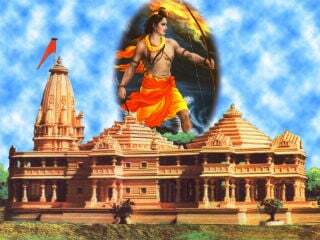 Mumbai : The issue of construction of ‘Shriram-Mandir’ at Ayodhya has been pending for 490 years, owing to fanatics’ invasion during pre-independence era and due to judicial process adopted in this country in independent India. 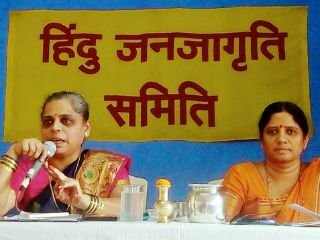 Hindu Janajagruti Samiti (HJS) took initiative, along with local festival committees and several pro-Hindu organizations, on 13th April in the background of Shriram-Navami in offering collective prayers at temples at different places in Mumbai and held chanting-sessions in temples for construction of huge Shriram-Mandir at Ayodhya without further delay, by expediting judicial procedure. HJS also undertook ‘signature drive’ for its demand of completion of judicial process on fast track. Thousands of devotees signed the representation and sincerely prayed for construction of ‘Shriram Mandir’ at the earliest. Mahim and Parel : Chanting –session of Shriram’s name was held at cloth market in Mahim where Shri. Anil Naik of HJS led the chanting session. 35 devotees were present on the occasion. Smt. Vijaya Muzumdar, the President of Devasthan and Shri. Anil Paradkar, its Priest extended cooperation. H.B.P. Raghunath Maharaj Ambre helped devotees in making a prayer at Shriram Mandir of Parel, Bhoiwada, for construction of ‘Ram-Mandir’. An appeal was also made for writing letters to the Court, for speedy hearing. 125 devotees were present on the occasion. 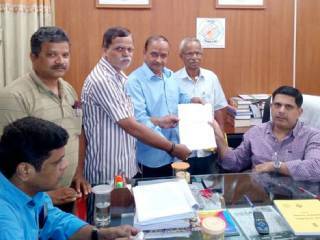 Ten devotees immediately wrote letters and handed them over to HJS activists. 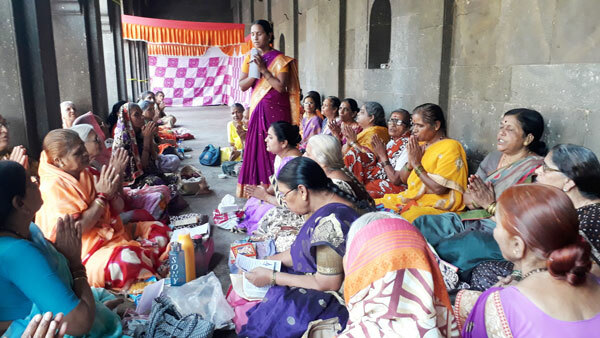 Bhandup : ‘Shriram’-chanting session was held at Datta Mandir on Village Road and special prayers were offered for construction of ‘Ram-Mandir’. Ten devotees wrote letter to Supreme Court for disposing of the case at the earliest. Mumbai : Book-exhibition was held on the occasion of ‘Shriram Navami’ at Shriram Mandir, Zavbachi Wadi, Girgaum. BJP- MLA Raj Purohit and Shri. Pandurang Sakpal, ‘Vibhag-Pramukh’ of South Mumbai visited the exhibition. Both of them bought few books. Shri. Raj Purohit said that he has been a supporter of Sanatan Sanstha. Devout Hindus offer special prayers for construction of ‘Ram-Mandir’ at Koparkhairane ! Koparkhairane (Navi Mumbai) : Bajarang Dal had organized ‘Shriram Janmotsav’ at Shri Vitthal-Rukmini Mandir. Devout Hindus offered special prayers for construction of ‘Ram-Mandir’. 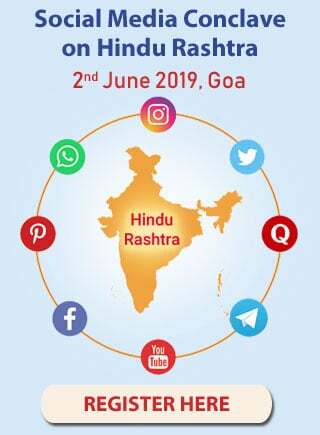 Prayer was also made for healthy, long life of ‘Paratpar Guru’ Dr. Athavale, the Founder of Sanatan Sanstha and for removal of obstacles in establishing Hindu Rashtra. Shri. Ram Rakhware, Priest of ‘Jai Shri Hanuman Mandir’ from Sector 5 made special prayer on behalf of all devout Hindus. 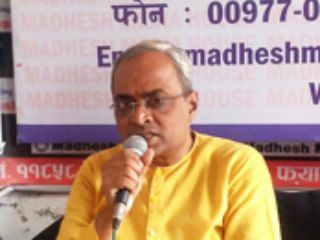 Dr. Uday Dhuri, spokesperson of HJS for Mumbai explained the need for construction of ‘Ram Mandir’ and its history. 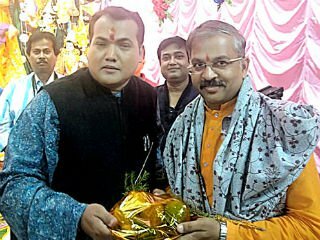 Many devout Hindus were present on the occasion including Bajarang Dal’s Shri. Sandip Bhagat, Shri. Sagar Kolhe, Shri. Sahebrao Gadhave and Shri. 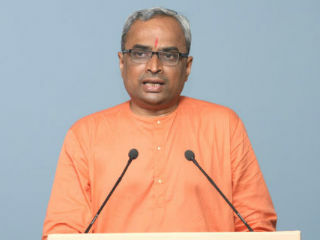 Dattatreya Jagtap etc. Shri. Eknath Chikane, Dy. 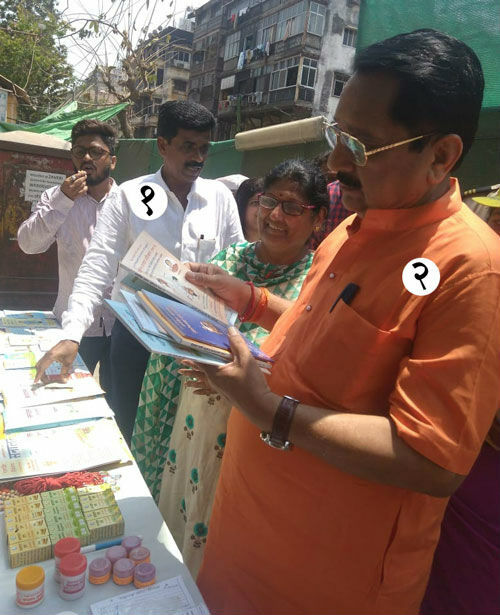 Shakha-Pramukh of Shiv Sena present on the occasion said that he felt that the program generated divine energy and such drive should be continued. Shri. Dattatreya Jagtap, a devout Hindu said that on the day of ‘Hanuman-Jayanti’ also such collective chanting should be held. Nashik :‘Shriram Naamsankeertan’ drive was undertaken for the purpose of establishing ‘Rama-rajya’ and construction of ‘Ram-Mandir’. Many women devotees and devout Hindu activists chanted ‘Shriram Jai Ram Jai Jai Ram’ for fulfillment of their wish of establishing ‘Rama-rajya’ and construction of ‘Ram Mandir’. More than 50 women devotees were present on the occasion. Other devotees visiting the temple for ‘darshan’ also joined them by raising slogans of ‘Jai Shriram’ in support. Spontaneous participation by youth with 500 two-wheelers at Yeotmal on the occasion of ‘Ram Navami’ ! Yeotmal : Parade of vehicles was taken out on behalf of ‘Ram Navami Utsav Samiti’ through 500 two-wheelers. Members of Bajarang Dal, VHP, Hindu Janajagruti Samiti, Sanatan Sanstha and large number of devout Hindus participated in this procession. 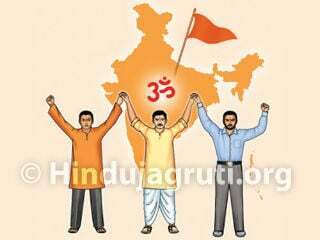 Saffron flags were hoisted on vehicles; amidst slogans of ‘Jai Shriram’, ‘Jai Hanuman’, ‘Jai Shivaji- Jai Bhavani’, ‘Vande Mataram’ , ‘Ghar Ghar Bhagava Chhayega, Rama-rajya Phir Ayega’ etc. An appeal was made through this march to join the procession that was to be taken out in the afternoon. The vehicle-march was started from Datta Mandir at Datta Chowk and was concluded at ‘Ram Mandir’ at Jaihind Chowk. 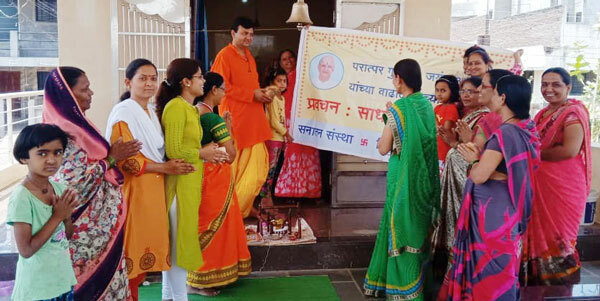 Pune : Various drives were undertaken at Pune on the occasion of ‘Ram Navami’ and birthday celebrations of ‘Paratpar Guru’ Dr. Athavale, Founder of Sanatan Sanstha. H.B.P. Charudatta Aphale, national ‘keertankar’ held ‘keertan’ on the previous day of ‘Ram-Navami’ at the ancient Ram-Mandir in Tulashibaug. He offered special prayers in the background of birthday celebrations of ‘Paratpar Guru’ Dr. Athavale. 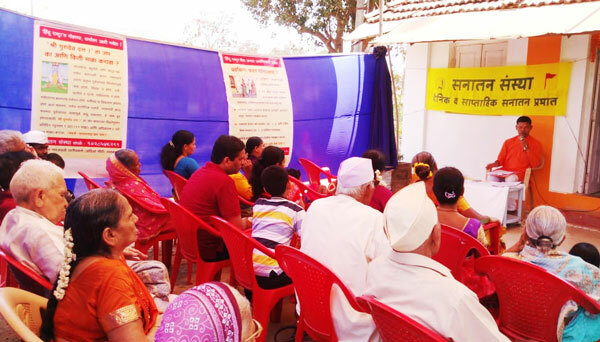 ‘Shriram Naam-sankeertan Abhiyan’ held at Roha and Penna (Raigad) ! At Ashtami Mandir when ‘Ram-naam’ was being chanted, Bhardwaj bird was seen and it was felt that the bird also stopped due to ‘chaitanya’ generated at this place due to chanting. Few Rama-devotees said that such programs were necessary in prevailing time rather than ‘keertan’. Special prayers were made in different temples for establishing Hindu Rashtra at Nandurbar ! 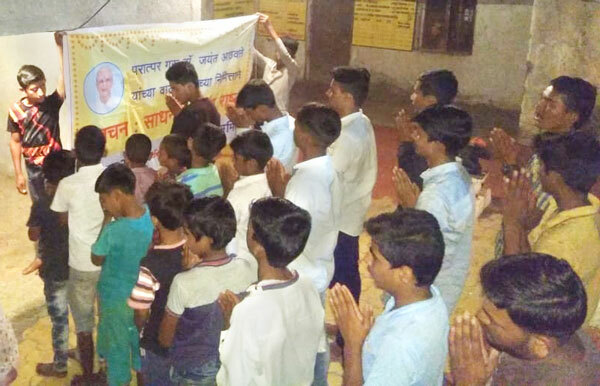 Nandurbar : Special prayers were offered at ‘Veer Bhadra Hanuman Mandir’, Vavad on the occasion of Shriram Navami and at Maruti Mandir, Dhandhane. 15 devout Hindus were present at Vavad, Nandurbar and 25 devout Hindus were present at Dhandhane. Chanting sessions held in Yeotmal district on Shriram Navami ! 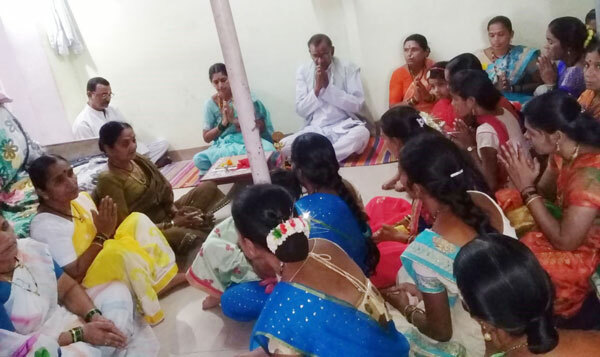 10 devout Hindus were present at Shiv Mandir Chikhalgaon, Vani; 300 devout Hindus were present at Gadagebaba Mandir Chowk, Vani; 150 Hindus at Kalaram Mandir, Vani; 20 women at Matamai Mandir, Pimpalgaon in Yeotmal; 17 devout Hindus were present at Hanuman Mandir at Ujwalnagar; 20 devout Hindus were present at Ner while 7 women were present at Darvha for chanting-session of ‘Shriram Jai Ram Jai Jai Ram’. 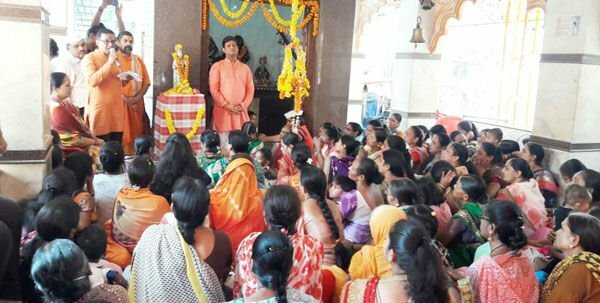 With the feeling of ‘Prabhu Shriram standing in front and chanting is done sitting at His feet’, participating women felt lot of ‘bhav’ at Pimpalgaon. Felt lot of happiness after chanting, said devout Hindus from Ujwalnagar, Yeotmal. Devout Hindus demanded that such chanting should be done even on Hanuman Jayanti. Devout Hindus from Ner chanting at Vitthal Mandir said that they too felt very happy after chanting and showed interest in getting such information on regular basis. ‘Shriram Naam-sankeertan’ drive at Thane and Kalyan ! Thane : Shriram Sankeertan drive was undertaken by ‘Hindu Chetana Mandal’ promoted by Bajarang Dal, Kolbad, Thane and Mardani Foundation, Thane on the occasion of ‘Shriram Janmotsav’. Special prayers were offered for removal of all obstacles in construction of Shriram Mandir after reciting ‘paalnaa and aarti’. Participating devotees sincerely offered prayers and did chanting. Devotees wrote letters requesting Supreme Court to take decision in case of Ram-Mandir at the earliest. 21 letters were obtained. Letters were written even at Kalyan ! Chanting was done at Gajanan Maharaj Mandir at Kalyan (West) and letters were also written. Everyone was given a post-card along with ‘prasad’; making an appeal to write it then and there. All devotees present asked for post-cards and wrote letters. Various drives undertaken at Jalgaon on the occasion of Shriram Navami ! Jalgaon : Collective chanting session of ‘Shriram Jai Ram Jai Jai Ram’ was held at Maruti Mandir, Dhanora. Devout Hindus made special prayers at Shriram Mandir of Bhusaval for establishing Hindu Rashtra and did collective chanting, on the occasion of Shriram Navami. Chanting in the Pashyantī mode of speech.